This Multi-Function Product’s advanced M40 scanner adds versatility to the product capabilities with the ability to scan documents up to 2mm thick, allowing users to scan more than just technical documents. The scanner has the ability to scan documents up to 315” in length as a PDF or JPEG file, and up to 590” in length as a TIFF file. The SmartWorks MFP software simplifies the entire Scan-to-Print, File, and Share process for users of all experience levels. Available as a free download, the iPF785 MFP M40 also offers Canon's Direct Print & Share software1, a cloud-portal based software solution that enables the viewing, sharing and printing of files from anywhere in the world, a new shortcut print button for drag and drop printing through hot folder technology, and is compatible with almost any cloud server that's WebDAV compliant. The solution is also equipped for mobile printing through use of the imagePROGRAF Print Utility app for iPad, available as a free download on the App Store2.The versatile Canon imagePROGRAF iPF785 36-inch large format 5-color printer is designed for use by professionals in a variety of different markets including Computer-Aided Design (CAD); Architecture, Engineering, and Construction (AEC); Geographical Information System (GIS) and other technical document professional areas to produce large technical documents or posters in color. 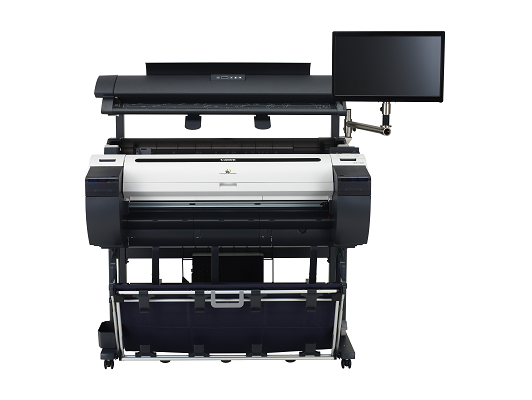 The included software utilities can be used in a variety of industries and applications such as in the retail signage industry as well as general office environments.The iPF785 MFP M40 provides the versatility and flexibility needed to be used in a wide variety of industries and applications, all in one captivating package. Borderless Printing Width 10", B4, A3, 14", A2, 17", B2 (20.28?/515 mm), A1 (23.38?/594mm), 24?, A0 (33.11?/841mm), B1, 36?